We’ve done it! We’ve rounded the Cape of Good Hope, although we’re still unsure of which part actually is “The Cape”. Since we’re in Cape Town now and the atlas says that Cape Town is on the Atlantic, we’re pretty sure we must have passed it by at some point… Anyways, we started somewhere over there and are now here. All was well and we have made it nicely. We arrived around 1600 after a half day of headwinds which were not as bad as we expected. We are surrounded by seals in the marina and they are taking up some of the pontoons in large quantities. Some of the pontoons are almost sinking because of the weight of these animals. Another thing is that it has gotten a lot colder here and some of us have actually caught a cold. Anyway, I’ll wrap it up here and you’ll hear from us again when we set sail onto the South Atlantic towards the Canaries. We have had a bit of a bum by ride last night. This coast is called the “wild coast” and that is for a reason. We’ve been sailing with good speeds all the way, but the seas are confused and there is a lot of chop. Not that we have anything to worry about because Helena is a good and steady ship and she handles all these waters with an amazing grace. All is good on board. Despite the lack of sleep we have enjoyed ourselves and practiced our navigation skills by refreshing all the light signals and color coding for beacons and buoys. We started a poll yesterday for our arrival date, time and location. Since our window is so tight, we are still unsure about arriving in Cape Town tomorrow. The distance is not the issue, but the changing weather forecast is and we may have to deviate to a different port. With the weather information from today, it seems that we will be able to make it to Cape Town, although we will probably have to motor for a couple of hours against the winds. Tonight we will be passing by the southernmost point of South Africa, which is strangely enough not Cape of Good Hope, but Cape Agulhas. This means that after tonight we will be starting our way north again and we officially will be on the Atlantic side of South Africa! This morning at 0600 we were preparing for departure again and we are now well on our way towards the actual Cape. We hope to be able to round the Cape of Good Hope by tomorrow night and then we hope to be in Cape Town on Monday. We have spent the last week in Port Elisabeth, getting acquainted with the local yacht club (which is very nice!) and doing some of our long term provisioning. We managed to get hold of a Makro card, so we could do a lot of our shopping already. We also spent a day in the Addo Elephant Park and had a great time. The weather window we have now is pretty tight again, so we will try and make it to Cape Town as fast as we can and luckily the wind and current are both helping us out today. We’re goose winging now with the Genoa and Main Sail on opposite sides and we’re doing a steady 8 to 9 knots through the water. The Agulhas current is somewhat weaker here and varies between 0 and 2 knots at times, so when it is there, it is in our benefit. We arrived at 0700 in Port Elisabeth and will wait here for another weather window. We decided to sail on to Port Elisabeth. The wind direction is good and the wind has increased a lot, so we’re making a lot of speed on top of the Agulhas current. This current flows with about 4 to 5 knots in the same direction, so we’re breaking some records again! We have to hurry up a bit since tomorrow morning the wind will shift again to the southwest which will cause some really rough weather. Therefore we also have the engine running to help us to keep the high speed. Last night was pretty quiet with no wind and only motoring which was a good start with new crew. Everyone had their first nightshift and we’re all getting used to the ocean again. We’re all reading a lot of books already and the atmosphere on board is great. This afternoon we were able to pick up some weather information and all is looking good for reaching Port Elisabeth in the morning, probably somewhere around 0900. After a couple of days preparing the ship, we had to wait for a little while before the weather window of today showed up, so this morning we left Durban and we are now on our way to East London. The ocean is calm and we are enjoying a nice and relaxed day on board Helena. We are gently motoring with about 2 knots current from behind towards the next city along the South African coast. Tonight we will run the first night watches to get into the routines, but we do not expect any excitement throughout the night. We hope to arrive tomorrow night in East London, but if the weather stays good, we will continue to Port Elisabeth as well. Re your query about rounding the Cape. See my diagram above. Cape Point is the most southerly tip of the cape peninsular in the L diagram above. 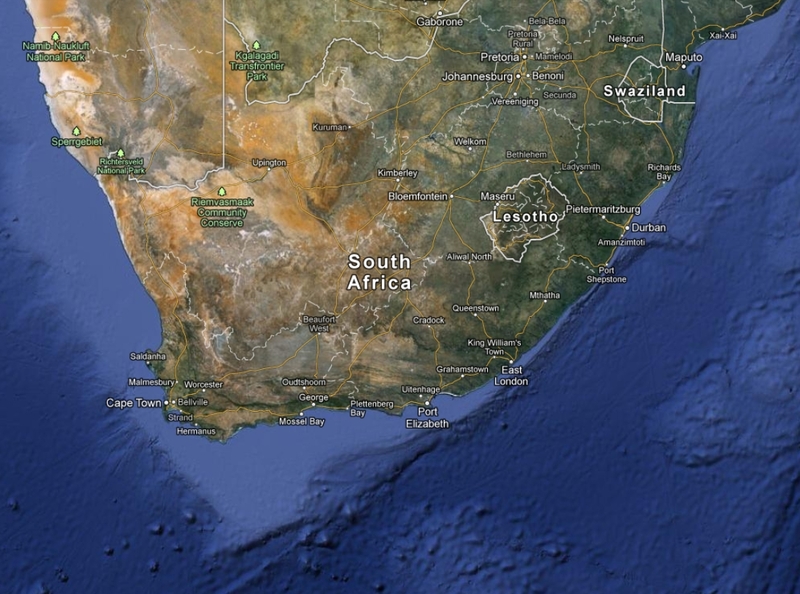 The Cape of Good Hope is actually west facing (the foot of the L). You would have rounded both these Capes. Cape Agulhas is in fact the most southern point of Africa. See my detailed Blackberry map above. Do not rely on this map for navigation purposes!!!!!! Hi, geweldig jongens, ben stinkend jaloers. Geniet ervan.